Tom Hawkins was a standout for the Cats with 12 score involvements. Who…. stood up for the Cats today? Mitch Duncan and Tom Stewart led the disposal tally for the Cats today with 26 touches apiece. Duncan was exceptional with his ball use, hitting up targets inside 50 every time he went forward. Tom Hawkins applied the greatest scoreboard pressure with three goals and 12 score involvements. What… can be done when Cameron and Finlayson are flying? Mark Blicavs and Harry Taylor started the day well on the inform duo of Jeremy Cameron and Jeremy Finlayson who kicked 12 goals between them in their game last week against the Tigers. However, the two Jeremy’s began to get the ascendancy in the second half and finished the game with three goals each. They were assisted by Harry Himmelberg and Daniel Lloyd who both kicked two. Where.. there’s Rohan, there’s excitement. Gary Rohan is becoming known for his impressive defensive efforts in the front half. Today was no exception. On three occasions Rohan’s pressure caused important turnovers, twice forcing the Giants to kick out on the full and an important smother in the dying minutes to cause an inside 50 stoppage. 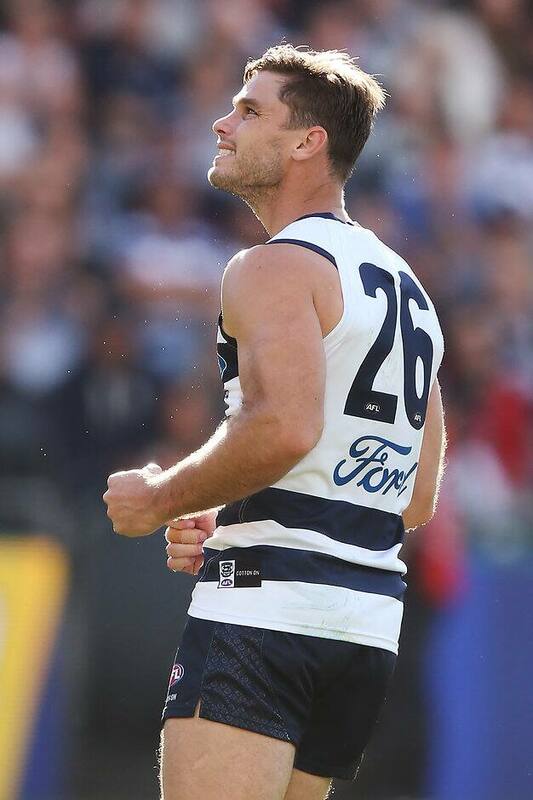 With two goals to his name as well, Rohan is becoming an excitement machine for the Cats. Tom Stewart showed his footy smarts when he played on and kicked long down the middle of the ground with less than a minute remaining. With four points separating the two sides it would have been absolute genius if the Cats were able to capitalise by the quick and direct ball movement. Unfortunately the Giants gained control and held onto possession, winding the clock down until the final siren, crushing the Cats chances.